Batam and Bintan are both popular holiday destinations that is situated not too far from Singapore. They are two Indonesian islands that can be reached within a few hours by ferry ride. Have an enjoyable experience when it comes to travelling to Batam and Bintan with Sindo Ferry. Make online booking through Easybook conveniently from anywhere as long as you have internet connection to access the website. Alternatively, download our mobile app available on both Apple Store or Google Play Store so you can make the ferry ticket purchases safely at any time and any place. Sindo Ferry Pte. 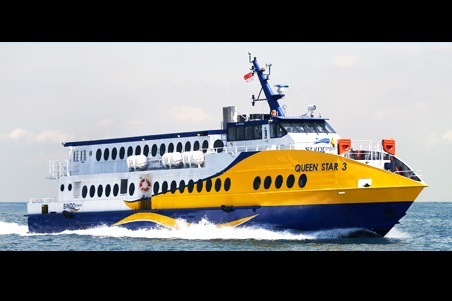 Ltd. is one of the largest and well-known ferry operators based in Singapore. Their ferries come with spacious legroom and comfortable seats in order for passengers to stretch out during their journey. This allows everyone to have a pleasant and safe trip to their respective destinations. Take this travel time to catch up with work emails or take it easy by catching up with a good book during the ride with Sindo Ferry. Travellers can easily avoid all the trouble of airport transfers when you choose to travel by ferry, which makes sea transportation such a popular mode these days between the two neighbouring countries. Currently, Sindo Ferry offers regular trips to and fro Batam, Bintan Island and Singapore. Note that all routes mentioned above come with return trips as well, so make sure to check for the Sindo Ferry schedule and the price according to your preference on Easybook website before making your online booking. Please note that there is a one hour time difference between Singapore and Indonesia. Avoid all the inconveniences of queuing up at the ferry terminals upon making the online booking for ferry ticket safely and quickly online within minutes no matter where you may be. Enjoy the windy and sunny sights at Batam, Bintan Island and Singapore upon booking Sindo Ferry services according to your travel schedule. Easybook offers a variety of ferry operators with attractive fare prices. Check out the Sindo Ferry schedule on our website for your next trips to Singapore, Batam or Bintan today. Once you have selected the pick-up and drop-off locations, departure and return date, as well as the number of people who will be travelling with, continue to share your details and make the payment. Follow these simple steps to start your stress-free holiday with Sindo Ferry today.